Family: Children 2 daughters and one son. Darkchild started out as an amateur wrestler and martial artist. His first love was always wrestling. He won numerous titles throughout high school and beyond. His forte was Freestyle but his martial arts training allowed him to also excel at Greco-Roman. His Amateur career came to an abrupt premature end in the Feb 93 when he broke his neck during a match in Berlin, Germany. While on the road to recovery, Darkchild had another setback. A traffic accident in which he broke his back. Recovery was an uphill battle but eventually he persevered and reentered the world of Pro Sports. Darkchild had received his first black belt at the age of 18 and started hitting the tournament circuit. He won several full contact titles and finally entered the world of Shootfighting. Though out his 12 year career Darkchild managed to rank up numerous titles throughout the Shootfighting world including 9 World titles. His proudest accomplishment being the European Cagefighting League Championship belt. While in the ECFL he racked up an astounding 305 wins without a loss. During this time Darkchild also played professional football in the European league with the Pillenstein Patriots. There he played Middle Linebacker and led the league in sacks and interceptions for three straight seasons. In the fall of 97 Darkchild moved to the USA and opened a martial arts school. He remained active in Shootfighting, competing in Extreme Fighting Challenge 19 in Hayward WI. Darkchild then turned his eyes to the world of professional wrestling. He applied for a try out at the WCW Power Plant but was forced to back out due to a knee injury. He then began training with AAW, a small indy league in Northwest WI. During his tenure with AAW Darkchild learned a lot about the wrestling business and about wrestling in general. He became known for his crazy stunts both in and out of the ring. 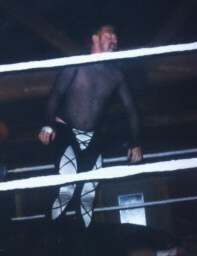 One of his more memorable stunts was the night he rappelled out of the rafters at the Wausau Field house and gave his finisher to Hannibal's manager Master Quinn. In the late fall of 1999 Darkchild had some creative differences with the owner of AAW and left the promotion for good. He then went to the NFW: An up-and-coming league also based in WI. His defection to the NFW had wide felt effects within the AAW. Within months sixteen other AAW wrestlers joined him in the NFW. In June 2000, Darkchild was invited to take part in the tournament to decide the NFW Heavyweight Champion. 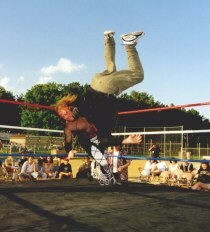 He won his first match against Dan Armstrong and then dove off the cameraman's scaffolding through his former partner Red Lightning. Due to the huge brawl at the end of Wrestlefest 2000 and ensuing injuries, the NFW decided to scrap the tournament. August 29th, 2000 saw Darkchild win the US Title from Red Lightning in a six-man tag match. He went on to defend in at the main event of Night of the Champions against Red Lightning and against several other members of both Quinn's Stable and later Roux's Crew. In 2001 he made the Midwest 50. A list of the top 50 indy wrestlers in the midwest (Ohio to the Dakotas to Missouri) The fact that five other NFW wrestlers also made the list says something about the level of competition in the NFW. He made this list again in 2002 and went on to win most charismatic wrestler in the entire Midwest.